There are direct trains from Crayford to Abbey Wood taking 15-20 minutes. True but if Abbey Wood is on zone 4 and Crayford in zone 6 there is a cost saving. I see where you're coming from - I think my bafflement is partly employment-based, though. Woolwich remains a fairly big employment centre - there are still a number of large retailers, and most Greenwich Council staff are based there. Plus the GLA itself agrees with the council's aspirations to promote Woolwich to "metropolitan centre" status; so it seems very odd to cut the bus service heading there from Greenwich by half. The development of North Greenwich tube station as a railhead is a really good example of the phenomenon you talk about - hugely popular and usually works brilliantly in the morning, utter nightmare in the evening. Although the zoning of the rail stations around the area (North Greenwich is in zone 2, the surrounding NR stations are zone 3 and beyond) means people keep using it. I suspect that there is an underlying and massive assumption about the effect of Crossrail on South Eastern, DLR and the Jubilee Line. We know that TfL are predicting a 2-3 year patronage dip on DLR post 2018/19. It's in the Business Plan and Budget. We also know that TfL are expecting an enormous switch of patronage and revenue to Crossrail. We also "know" that the DfT are blithely assuming that the Greenwich line (I know trains from Woolwich can take different routes) will also suddenly lose passengers to Crossrail and the implication seems to be that people will swap to where there is space. You will know far, far better than me how ludicrous some of the DfT's assumptions on housing are and their resultant view on the lack of any need for capacity expansion on the Greenwich line or, indeed, via Kidbrooke. I am not at all convinced that the modelling assumptions are correct because there will be so much "dynamism" in passenger modal choice for several years coupled with a likely continued upward pressures on numbers (from more housing coming on stream). The only thing that would undermine all these forecasts is if the economy tanks badly and London takes a disproportionate hit this time (certainly a possibility). Your observations about pricing and travel cost and the fact that NR fares will keep rising and South Eastern's probably higher than most (new franchise) is, I think, a very important factor as to quite how the modal distribution and travel patterns pan out post 2018. I am of the view, like you, that TfL may get one heck of a fright and may need to backtrack on some aspects of these proposals (assuming they proceed unchanged). A few things stand out to me in this consultation. The 129 gets my thumbs up. Completely agree with this idea as the 108 will be recieving much needed support while providing an alternative routing to and from Lewisham. This also means giving the route some useful length instead of its current shuttle-like form. The rerouting of the 180 means that North Greenwich will get a new link to Erith and vice versa. This is a positive proposal as there will be assistance provided to the 472 between North Greenwich and Plumstead alongside while introducing new links. 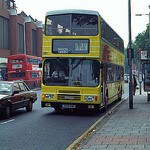 However, it would've been sensible to reroute the 180 via Bugsby's Way parallel to the 472 rather than the 161's routing. 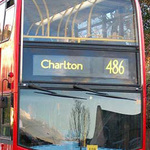 Extending the 472 to Abbey Wood and its new routing means it would provide a useful connection between North Greenwich and Abbey Wood as well as eradicating the awkward loop through Thamesmead. These are sensible changes as the 472 would still traverse Crossway while conveniently serving Abbey Wood and connecting to Crossrail. Not quite sure what the rationale behind the introduction of the 301 is. This means there will be an alternative means of travelling between Woolwich and Bexleyheath to the 96/99/422. I acknowledge the 301 is somewhat a relatively local route, however a fourth route linking the aforementioned areas is excessive. Also the fact that it would mirror the 472 between Woolwich and Abbey Wood albeit via a different routing is questionable. I would definitely advocate an extension to the 301 to give it more exclusivity. I think your seriously under estimating how useful the 129 is currently - in many cases, a short route can be just as useful as a long route. I agree with the extension on the basis of covering the 180's lost section but even before that's implemented, it provides much valuable capacity in it's current form. The 301 provides a direct link between Thamesmead/Abbey Wood which currently can only be done by the more indirect routings of the 229 & B11 - no one except myself will unlikely use it from Woolwich to Bexleyheath and instead will be useful for transporting workers to the industrial area along Nathan Way as the 472 does whilst allowing the 472 to take the quicker routing via Western Way. Another idea would be for the 301 to run between Bexleyheath and Thamesmead which should be ok with single deckers. Crossrail feeder and direct link between Bexleyheath and Thamesmead. The double decked 178 could then be extended to Abbey Wood over the proposed 301 route giving the often suggested direct link between Thamesmead and Lewisham. Ironically the 178 started life as a Woolwich to Thamesmead service. Re. the Woolwich/Greenwich NR line : my suspicion is that the Southeastern side of Abbey Wood, Plumstead, the Southeastern side of Woolwich Arsenal and possibly Woolwich Dockyard will see a decrease in numbers using them. TfL may have a nasty shock if they believe other stations will have a decrease, and I also think many passengers from Slade Green, Erith and Belvedere will remain on their Southeastern train into Central London, especially if they have a seat. I don't think there is any doubt that there will be a considerable drop in usage of southeastern services west of Woolwich and of course people changing onto Crossrail at Abbey Wood will get a seat as the train starts from there. As it is now a lot of people change at Woolwich Arsenal onto DLR. I suspect that is the thinking behind the bus service reduction between Woolwich and Greenwich and I'm surprised that a reduction hasn't been proposed for the 53. Yes indeed. I never underestimated the 129, it is undoubtedly useful and used very well in its current form. I was stating that the 129 would become more of a substantial route with the added route length, covering more areas and providing new links with the extension to Lewisham. People from Charlton westwards I would say are most unlikely to head east before going back west again. I agree, there will probably be a drop in usage of the SE Woolwich line, I just don't think it will be anything like what TfL think it will be. The 53 doesn't parallel the railway in quite such a blatant way that the 177/180 do, which I guess is why the 53 corridor isn't proposed for reduction. Generally I'm sure people will just head for their nearest railway station, I don't envisage people going out of their way to get to Crossrail. I expect the Southeastern service from Woolwich to Blackheath and Lewisham, with a change there for New Cross, will have plenty of spare capacity which could make the 53 vulnerable? Indeed, what may happen is that a chunk of passengers who squeeze onto the bus to North Greenwich may start using National Rail again once a few more seats become available - the Thameslink Programme will be finished by then, services will improve and there'll be better interchange possibilities at London Bridge (as well as the Greenwich line's own Thameslink service). As snoggle says, there'll be a few years of flux - but against the background of a still-growing population. Any drop in usage may only be for a couple of years. The main problem in that area is the Greenwich Peninsula's huge over-dependence on North Greenwich station combined with the Jubilee LIne's lack of capacity - so you have 10,000 new homes within walking distance adding extra demand on the station at the same time as you have people demanding bus links there from distant places like Erith or Crayford. Canary Wharf is by far the most popular destination from North Greenwich - there's no walking/cycling or bus link that short distance across the water, and no plans for one. In years to come, TfL will deeply regret Crossrail swerving around the Greenwich Peninsula. Or even a shame the airline doesn't link North Greenwich directly with Custom House and Crossrail. Given the substantial amount of development planned, any drop in demand on Southeastern west of Woolwich is likely to be short term. As has been noted, there may well be a shake out of passengers who headed to North Greenwich returning to Southeastern as the service returns to normal after the London Bridge rebuild. Very few people west of Charlton, unless they have a very specific journey demand, will head into Woolwich for Crossrail because they will need to add zone 4 to their journey - go to North Greenwich, and you only need zone 2. Similarly, I don't see the 53 being under threat from the example you give. Firstly, Southeastern services are more expensive. Secondly, there will only be a train every half hour through the Blackheath tunnel to Lewisham. The 53 also sees a lot of through traffic to the railway desert west of New Cross Gate up to the Elephant. That said, I was slightly surprised that the 53 survived east of Woolwich, as I was expecting this to fall to some kind of local feeder service.